April 25, 2014  President Obama is in South Korea, on another stop in his four-nation swing through East Asia. He voiced support for the country amid North Korea's threats to detonate another nuclear device. April 24, 2014  President Obama is in Japan for the start of his four-nation Asia visit. The trip aims to assure U.S. allies that they're not forgotten, even as China gets more bullish with its neighbors. April 23, 2014  President Obama is visiting East Asia, stopping in Japan and three other countries. The trip aims to assure U.S. allies that they're not forgotten, even as China gets more bullish with its neighbors. April 21, 2014  More than 200 people remain missing after the ferry capsized last week. One family was told their daughter was dead instead of missing. It turns out authorities had confused her for another girl. April 20, 2014  It's been a week of tragedy for the community of Ansan, an industrial town near Seoul. Many of the high school teenagers who sank with the South Korean ferry last week attended high school there. April 18, 2014  The rescue and recovery mission is continuing off the southern coast of South Korea after a ferry capsized earlier this week. More than 200 people are missing. Bad weather is hampering the efforts. April 17, 2014  The search continues for survivors and answers in the South Korean ferry disaster. NPR's Anthony Kuhn offers details on the latest developments. April 17, 2014  Strong currents and rain are hampering rescuers in the search for more than 200 passengers missing after a ferry flipped onto its side and filled with water off the southern coast of South Korea. April 16, 2014  Dozens of boats, helicopters and divers scrambled Wednesday to rescue more than 470 people after a ferry sank off South Korea's southern coast. Among those on the boat, 325 high school students. April 9, 2014  The ancient city of Angkor Wat has gotten the Street View treatment. 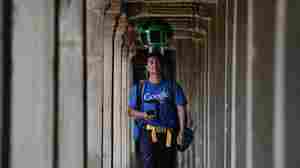 Google says it combined 90,000 panoramic images to let people explore the country's famed temples. April 4, 2014  Cold Food Day in China commemorates a hermit who 2,600 years ago refused wealth and power. His ruler tried to smoke him out of his mountain hideout, but ended up burning him to a death. March 28, 2014  Many relatives of passengers on Malaysia Airlines Flight 370 are furious at being told that there is no hope of finding their relatives alive — and many are convinced of a conspiracy. March 27, 2014  The trip represented a sort of diplomatic change of pace from the usual issues of cyber espionage, trade spats and geopolitical competition that grab U.S.-China-related headlines. March 24, 2014  Malaysia's prime minister concluded that Malaysian Airlines Flight 370 "ended in the southern Indian Ocean," setting off howls of grief and anger among passengers' families. The search continues for debris that would confirm the flight crashed.